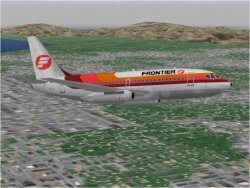 ﻿ Aircraft: Flyable What can you fly in Flight Sims? What can you fly in Flight Sims? A development of the Lincoln, the more powerful Shackleton served well beyond its intended lifespan in both the maritime recon and AEW roles. To see the mighty Vulcan in action check out the James Bond movie Thunderball. What an utterly fantastic looking aircraft - a flying sculpture! Powered by 6 28-cyl radials (and later 4 turbojets as well), the B-36 flew high and slow. It was not uncommon to stay aloft for 2 days without refuelling. The virtual cockpit is good and combined with the pop-up Altimeter - Airspeed and Rate of Climb panel makes it a good choice for visual flights. "The first jet-powered strategic bomber to serve with USAF, over 2100 were produced. " Starting this beast up and watching the Engine indicators - count them! - come to life is fun. Landing it is even more fun! The Mirage crashes Microsoft Flight Simulator 2002 when you attempt to load it. These pictures were taken in Microsoft Combat Flight Simulator (1998) at RAF Woodbridge. I spoke to an Australian former Vampire pilot some years back. He told me that the Vampire had several throttle settings which were not used because of vibration. Naturally enough, in accordance with 'Murphy's Law', when flying the circuit the throttle settings you wanted to use corresponded exactly with the vibration zones! Designed in 1949 as the successor to the Vampire, the Venom's more powerful Ghost engine and its stronger airframe made for a much more effective aircraft. Total production of the F-86 exceeded that of any fixed-wing fighter at a staggering 9,502. The successor to the F-86 Sabre, the F-100 was the first combat aircraft to break the sound barrier in level flight. Note that F-8 lowers full flaps and the brake chute. The '102 had a dual-stick control system where the pilot controled the radar with one hand and flew with the other. The Dagger was also unique for a fighter in that it carried missiles internally. S models feature upgraded engines and avionics making them truly all weather fighters and the last production models. As the RAF's first purpose-built night and all-weather interceptor, the Javelin was a large aircraft who's thick delta wing prohibited supersonic flight. First flown in 1951, many variants were produced, the latter ones with afterburning engines. First flown in 1952, the 'crescent' wing was a tremendous technical achievement. However, Soviet missile advances soon rendered the Victor's mission obsolete and despite being upgraded to B2 standard in 1959 with its much more powerful engines, the Victor had to be consigned to the low-level role. ... all the various marques of Hunter were a delight to fly and much admired by their pilots. Many still fly today in the hands of private owners. Total production was 1,985, 79 types flew with 17 air forces. Its extreme range and ability to carry offensive weapons on up to 8 hard points make it a potent anti-submarine platform. The Valiant dropped the atomic bomb over Maralinga, South Australia in 1956. Air Power Cold War Ilyushin Il-28 "Beagle"
Air Power Cold War Mikoyan-Gurevich MiG-15 "Fagot"
The MiG-15 out-turned, out-climbed and had a higher service ceiling than the North American F-86K Sabre. Also - the original NATO reporting name was "Falcon" - it would be interesting to get the story behind changing the name from that of a 'Bird of Prey' to a 'block of wood'! Air Power Cold War Mikoyan-Gurevich MiG-19 "Farmer"
As Russia's first supersonic fighter, the twin-engined MiG-19 was a truly formidable aircraft for its day. Air Power Cold War Sukhoi Su-11 "Fishpot"
The Su-11 first went into service in 1968 as a replacement for the ageing Su-7 and Su-9 and benefited from its predecessors' extensive combat history in other Warsaw Pact countries. It was designed as an all-weather interceptor and had a phenomenal climb rate, with a service ceiling of 55,000 ft.
"In 1952 the first Tu-16 ( NATO Reporting name 'Badger' ) flew and represented the new generation of Soviet bombers to be produced during the 1950s. Built in large numbers, some 2000 were made before production ended in 1960." Air Power Cold War Tupolev Tu-142 "Bear"
Being the fastest prop aircraft in the world and having an extraordinarily long range makes the Tu-142 the ideal choice for a weekend away! Air Power Cold War Yakovlev Yak-28 "Firebar"
Quite a handful around the circuit this one but heaps of power. The low- slung design reminds me of 1950's American autos. Flyable Aircraft: Spitfire, Hurricane, Messerschmitt Me-109, Messerschmitt Me-110, Ju87 Stuka. German: Bf-109G-6, Bf-109G-6/AS, Bf-109G-6-Late, Bf-109G-10, Bf-109G-14, Bf-109K-4, FW-190A-5, FW-190A-8, FW-190A-9, FW-190D-9, Me-262A-1, Me-262A-2. "The Bf.109 was the Luftwaffe's benchmark fighter throughout WWII. It first flew in 1937, saw combat during the Spanish Civil War, and some variants remained in service until the end of the war in 1945." "As learned during the Battle of Britain, the Bf110's only hope of survival is to keep airspeed high, execute hit-and-run attacks from high altitude, and avoid lengthy turning battles with single-engine fighters." "The Fw190A series was arguably the best fighter in the Luftwaffe inventory in the early 1940s and considered by some to have been the best fighter in the world at that time, earning the name 'Butcher Bird.' "
"The P-38 is a decent dogfighter, and ETO pilots reported it could out maneuver any Luftwaffe fighter between 18,000 and 31,000 feet, and hold its own against lower-altitude opponents." "The P-47 was built in larger numbers than any other US fighter in history. From 1942 until the introduction of the P-51, the P-47 was the US Army's workhorse, performing both air-to-air and air-to-ground sorties." "The P-51 will always be remembered as the fighter that won the air war in Europe. " "Turn performance is good, but being slower meant that the enemy could generally dictate the terms of the fight, disengaging at will. Subsequently, later Spitfires added emphasis on speed. " "Used mainly for ground attack, the Tempest is a very fast aircraft, making it an excellent interceptor against V-1s. " "The Typhoon accelerates well in a dive, reaching speeds around 500 mph, and subsequently suffering from compressibility problems as the local airflow over the wing approached the speed of sound. Like the P-38, Typhoon pilots need to closely monitor their speed in a dive." Fighters Anthology Mikoyan-Gurevich MiG-21 "Fishbed"
A-6 Intruder, F-4 Phantom, MiG-21. Fockewulf Fw-190, Ilyushin IL-2, Junkers Ju-88, Lavochkin La-7, Yaklovev Yak-9.